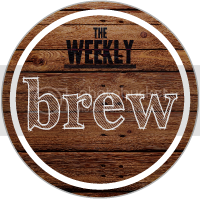 Today I'm joining Elle at Dig Deep Studio for The Weekly Brew, a brand new link up where you can talk about anything that is brewing up in your little cup of life. What a wonderful weekend I have had! On Saturday, the little coffee-n-ink family drove out to San Diego so that I could finally meet one of my very dear bloggy-friend-turned-IRL-friend, Brooke. She and I met almost two years ago in this bloggy world and have exchanged conversations through blog posts, emails, tweets, and texts throughout these last two years. She has since stopped blogging but our friendship did not. We spent a beautiful blistering day in San Diego since she was out here for work. I had been looking forward to meeting her forever! When she ran out from her hotel lobby to give me hugs - oh goodness, it was like seeing an old friend again. Brooke, you see, has got me through a lot of life stuff, including this crazy place called the internet. She designed my former blog at one time and we became pretty much soul sisters from that point on. That is what is so awesome about our community that non-bloggers could never understand. Meeting Brooke face-to-face for the first time, after knowing her for so long online, was so normal. Having the Hubs there was the icing on the cake. He could finally see in real life what special relationships we build as bloggers...as friends who don't need to meet to be thisclose. You understand, of course - my Hubs? Well, now he definitely does. We talked, laughed, laughed 'til we cried, shared, and all in all - it was perfection. We drove home on Sunday with my Hubs saying how happy he was to have been able to see what my blogging has given to my life. He really loved Brooke - they got along great - splendidly, really! It was warmth to my heart. This weekend ended with a warm living room filled with my Hubs and kids - cuddled up in a blanket, watching one of Mommy's favorite movies. Ending the day with a "blogger"-kinda movie was exactly how it was supposed to end. With "Julie" and her blogging meltdowns, her "I've got 53 comments! "....yes, my Hubs watched with me and was like, "Yup, I get it now." Yes, you do, sweet Hubs. Now you can officially be called a bloggy husband. The brew this weekend was of the best quality. It had my cup spilling over. Share your Brew...link up any post to Elle's new linky. I loved what she wrote today, too. And I know you will to. I think this is awesome! Mostly because I know that when I finally make it out there (and it will happen), you'll try to convince me that the other place is better than In-N-Out, and we'll drink coffee, and laugh, and make that Hubby of yours mix us up some Margs. And it will be the best day ever in a long time.